There are three types of waterless urinal technology. Oil or chemical cartridges - urine passes through a oil or chemical-based barrier which is then supposed to form a seal which reduces odours. Using this system requires expensive cartridges to be replaced every few months, and the maintenance costs are high, particularly since the oil seal can easily be accidentally broken, for example by a cleaner washing a bucket of water down the urinal. Sleeve technology - urine passes through a sleeve and then through a seal into the waste system. Using this system can also be expensive as the sleeves need to be regularly replaced. Plus the seal needs to remain moist which can lead to some hygiene and odour issues. URIMAT's patented ActiveTrap - URIMAT waterless urinals are the only ones that use this technology, which is much more effective at preventing odours and hygiene issues as well as being significantly cheaper and easier to maintain. 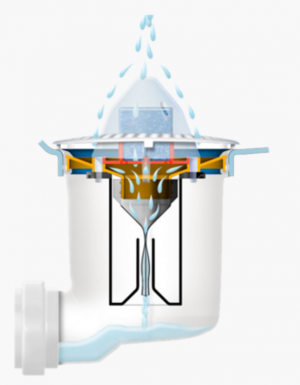 The patented and exchangeable ActiveTrap used in the URIMAT Urinals collects the urine and discharges it (without using water) into the drainage system. No pollutant oils or chemicals are used and no odours can develop. How does the MB ActiveTrap work?